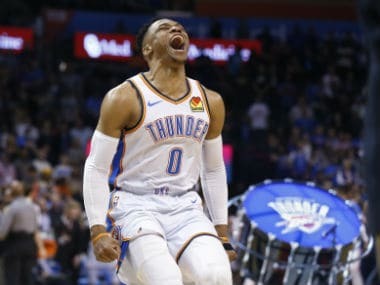 Los Angeles: Oklahoma City Thunder star Russell Westbrook posted an astonishing triple-double of 20 points, 20 rebounds and 21 assists on Tuesday in another historic display of all-around excellence. Westbrook was already closing in on a third straight season averaging a triple-double – achieving double digits in three key statistical categories in a game. In the 2016-17 season he set the record for most triple-doubles in a season with 42, averaging a triple-double in that campaign and again last season. 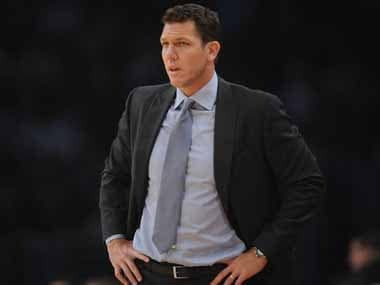 With his performance on Tuesday in a 119-103 victory over the Los Angeles Lakers, he joined NBA icon Wilt Chamberlain as the only other player in NBA history to post a triple-double of at least 20 points, 20 rebounds and 20 assists. Chamberlain did it in 1968, when he had 22 points, 25 rebounds and 21 assists in a game for the Philadelphia 76ers against Detroit. 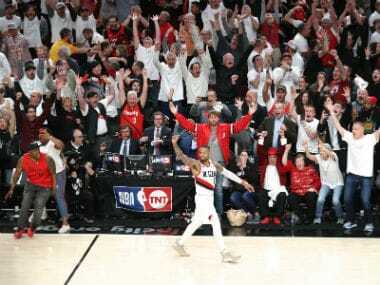 Westbrook dedicated his performance to slain rapper Nipsey Hussle, who was gunned down on Sunday in Los Angeles. "That wasn't for me," Westbrook told broadcaster TNT after the game. "That was for my bro. That's for Nipsey – 20 plus 20 plus 20 ... that's for my bro, rest in peace Nipsey." Playoff-bound but losers of seven of their last 10, the Thunder can use every win they can get in the final week of the regular season. "Each game is important now," Westbrook said. "I'm just thankful to be able to go out and compete at a high level. I'm thankful to have these teammates, thankful and humbled to be able to go out and play the game I love."